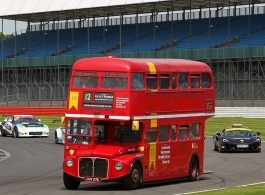 Traditional and Classic Routemaster buses for wedding, prom and event hire throughout Northamptonshire and parts of Cambridgeshire, Buckinghamshire and Oxfordshire. The Red Routemaster buses are a very popular & cost effective mode of transport which are unique and practical. There are a choice of two of the Routemasters which combined can transport up to 144 of your wedding guests. The other Routemaster from this fleet is vehicle code 0197.